Notes: 2001 Tim Hills: Of the two trunks, one is leaning and hollow. The other, more substantial, has gradually leaned until part of it rests on the ground. I was unable to trace the 'old root'. The final photo shows a twin trunked yew that grows 20m NW of the old yew. Latest information: March 2016 Paul Wood: The old yew is slowly being hidden behind thick ivy, nettles and brambles. 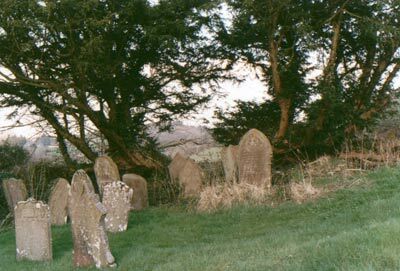 Although the churchyard is kept tidy and looked after the yew appears not to be considered worthy of attention. All bole detail was hidden well away from sight. A younger twin trunked yew grows 20 metres north westerly and a very young yew is beginning to establish roots 15 metres south of the recorded tree.